When I was a child my family called these birds Sandpipers. I have a book on shore birds of North Carolina but I can’t find it tonight. If I could find it I might be able to say what kind of sandpiper he or she is. If anyone knows, let me know. ~ by Sandra Lynn Gray on September 30, 2007. It looks like a Baird’s Sandpiper to me… Have you had anyone else identify it (or found other identification online)? 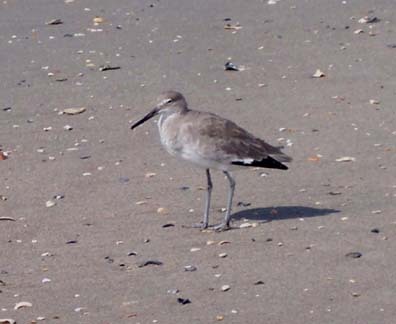 That’s a Willet, a common large sandpiper on our beaches. When they fly, the drab gray is suddenly punctuated with bold blask and white stripes in the wings. And they have a loud, energetic call, too.